While I always attempt to identify the weapons and munitions sent to me sometimes I get stumped, and these following videos are two examples of weapons that I've been unable to identify. 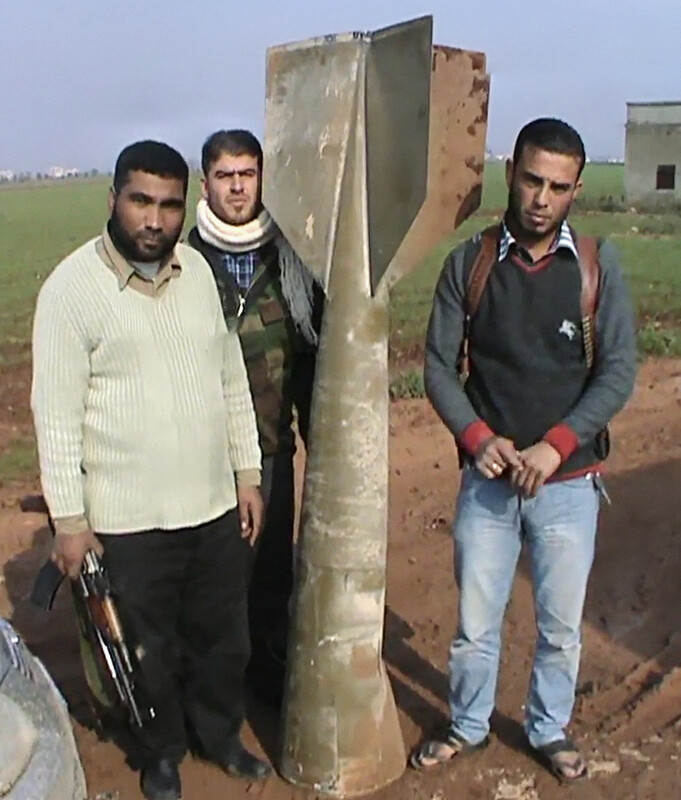 This first item, supposedly dropped from a MiG, shows what appears to be a tail section from an unguided bomb. To me it appears to be just he tail section of a bomb, and appears to be unusually thin, with massive tail fins, suggesting the bomb would be much longer than what we can see in the photograph. The tail fins are also missing the ring that's common in many of the other bombs used so far in the conflict (which can be seen here), and having reviewed a large number of Soviet and Russian bombs (commonly used by the Syrian Air Force) I've been unable to find a match. This second video from Daraya, near Damascus, shows what may be some type of rocket. The fixed tail fins and tail ring would suggest it was not a tube launched rocket, such as those used by the BM-21 Grad, and I've yet to see any rockets or bombs used in the conflict with those square tail fins. As I'm totally stumped (along with many other arms researchers I've spoken to) I'm asking if any of you recognise these devices. If you have an idea what these could be leave a comment below, or send me a Tweet or email at the usual places. Is the second one a torpedo? Something naval perhaps the 2nd ?